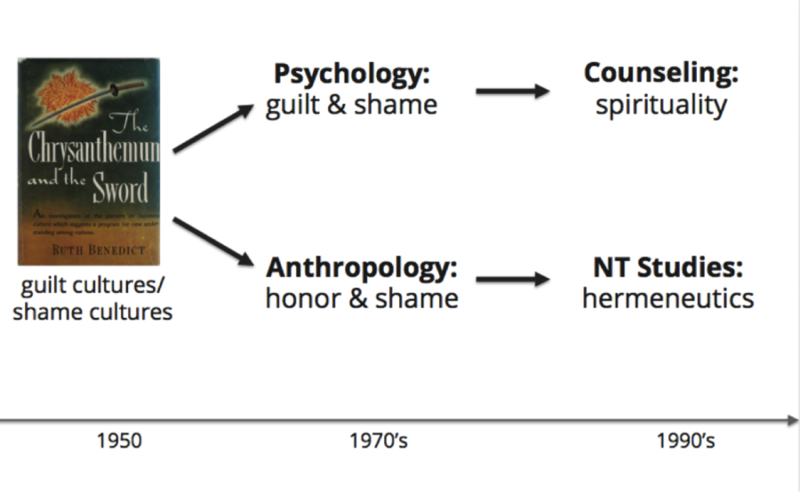 Where do these categories of “guilt-shame” or “shame-honor” come from? Like all ideas, the notion of “shame” has developed over time. This post summarizes the main currents of shame research in the 20th century. 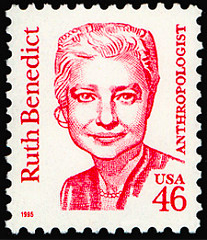 The binary labels of “guilt-culture” and “shame-culture” is often credited to American anthropologist Ruth Benedict. Anthropologists contrasted “guilt” and “shame” in the early 1900’s, but Benedict’s book The Cross and the Chrysanthemum (1946) popularized the classification. World War II pitted Western militaries against an industrialized, non-Western power for the first time. To understand the mindset of their enemy in the East, the U.S. military commissioned Ruth Benedict to study and explain Japanese culture. Benedict explained how Western culture was controlled by internal conscience, whereas shame cultures like Japan use public opinions to sanction behavior. Her book was highly influential in the U.S. military, Western academia, as well as in Japan and China where translations become bestsellers. Once can hardly underestimate the influence of her book in this discussion. Even though anthropology after Benedict critiqued elements of her guilt-shame dichotomy, the categories continued to frame the discussion. In the 1960’s and 70’s, cultural anthropologists such as Julien Pitt-Rivers of Oxford developed the idea of “honor-shame cultures” by researching Mediterranean cultures. Their research developed anthropological models such as challenge-riposte, patron-client, ascribed vs. achieved, kinship, purity, limited good, etc. These anthropologists explained the nuances of honor and shame in Mediterranean societies with great insight. In the 1980’s and 1990’s a group of biblical scholars led by Bruce Malina and Jerome Neyrey began applying those anthropological insights to the New Testament. The Context Group, as they labeled themselves, used “social-science criticism” to expound the honor-shame aspects inherent to the New Testament. Their work was primarily academic, so focused on history and hermeneutics more than practical theology. Several evangelical NT scholars in the 21st century like David deSiva and Kenneth Bailey leverage insights from the social sciences to interpret biblical texts. Their works are notably less dependent upon constructs of Mediterranean anthropologists of 50 years ago, and points towards pastoral applications of honor-shame. In a separate field of thought, psychology began discussing guilt and shame in the 1970’s. So the psychology of guilt and shame is rather developed. Christian psychologists like David Augsburger (1980’s), Lewis Smedes (1990’s), and Edward Welch (2010’s) have adopted those insights for Christian ministry and counseling. Compared to anthropology, psychology views guilt and shame as personal feelings, not public social sanctions. They describe the emotional dynamics in an individual, not the social realities between people. Psychologists typically view guilt as helpful and shame as hurtful. Consequently, Westerner’s perceive shame as mostly negative. So when anthropology defines cultural groups as “shame-based,” negative assumptions get unfairly attached to those cultures. This image here summarizes how “shame” has developed in research. Since 2010, two realities have brought “shame” out from the psychologist’s office into mainstream conversation: Brene Brown and social media. Brene Brown is a shame researcher at the University of Houston. Her 2010 TED talk, “The Power of Vulnerability” become the second most viewed videos on TED.com and YouTube. Her bestselling books Daring Greatly, The Gifts of Imperfection, and I Thought it Was Just Me offer inspiring stories and practical insights for overcoming shame. Brown proposes empathy, vulnerability, and community as the antidote to shame. 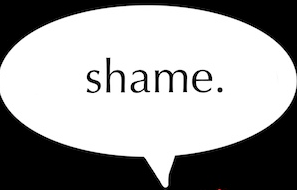 Social media has also introduced shame into mainstream Western culture, but more at an experiential than cognitive level. The explosion of “internet bullying” and “digital shaming” has directly exposed modern people to a reality long relegated to “traditional cultures”—disgrace, shame, honor, etc. Social commentators note social media creates a new “shame-culture.” For example, the March 2015 cover story of Christianity Today, “The Good News About Shame”, proposed “social media is leaving us more ashamed than ever—and more ready to hear the gospel.” The deluge of digital shame has sideswiped Western culture and forced us to reckon with a resurgence of shame.